I HAVE THIS HABIT of searching random blogs online. As I type this, I am scanning the blogs of some models and musicians. The entries are filled with huge pictures. They speak about themselves. They show off the things they have bought; dresses, makeup, perfume. They are stunning on every shot: attractive, smiling. They portray the finer things in life. In fact, most blogs I come across do illustrate the sunny, to the point of becoming materialistic, side of living. And if they don’t, they portray the extreme opposites: angry and sensitive. They talk endlessly about past heartbreaks. Uselessness, the angst, the negative energies are locked up on their websites. A handful of other sites focus on their interests such as politics and cooking. Others keep a blog for posting original stories, all of which are impersonal to ponder upon. I am someone who takes pleasure on reading blogs. I like the fact that they are from other countries and I can learn lots of things about their culture, plus other things of good interest. Also, the thought of sympathizing with their everyday events is appealing. Interaction can always be started through comments. I have friendships that began online through blogs. We regularly talk about points of interest until we decided to meet up. And when we got together, it feels as if we have known each other for a long time. Thanks to blogging, my life has mingled with people I wouldn’t have met if I were living my life outside the internet. Also, at this point I begin thinking exactly what side of me I am presenting to my readers. Why do I maintain this blog? Do I want to present the stressful life an emergency room nurse manages? Do I write this for remembrance of what I am now? Is this blog made for boasting the good things I am blessed with? Is this blog created for confronting my inner frustrations, or for self-satisfaction? My answer to every question is yes. I want the world to know me, even in this futile way. I mean, no one will bother searching my name on Yahoo or Google for I am not a popular artist, still I write down my thoughts on this site for everyone to see. I want to strike a balance between being materialistic, being contemplative and sentimental, without being the fake person I once was. When I was still a newbie in the world of blogging, I admit I wrote lies to sound more interesting and to earn more comments. Later on, I realized it is tiring to be someone who I am not. I also felt guilty for misleading many people. Being true to oneself, and loving oneself for being who he or she is, is the most important thing to do before he can be loved by other people. I have read my previous blog sites, and I feel a mixture of pride for composing some thought-provoking entries. But most of the time I feel somewhat dismayed for wasting my time away over superficial things. Now that I am still striving to grow on my seventh year of blogging, I want to rewrite how the world should know me. I want the world to know Mia as Mia, not as my other fancy online handles. This is me; this is my footprint. 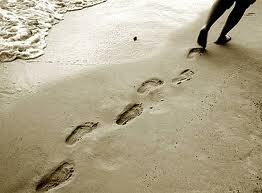 Having footprints is not limited to having a website. As early as now, I keep on wondering how my loved ones will remember me if I were to die early. I begin thinking about the quality of life I should lead, the impact I should leave in every person I meet in every day. Will I be the person remembered for being cheerful, or for leaving sour remarks? Diligent, or too dependent? I know there will be positive and negative aspects with which I will be remained in memory. I won’t be popular like an artist, but I can be popular in my own way. So from now on, just like writing good blog entries, let’s make good memories everyday. And no, being a common folk or a celebrity, or the number of received comments or page views, will never be an issue here. Copyright 2010. OurHappySchool.com. All rights reserved.